Make these delicious lemon bars from an easy tray bake recipe. These lemon bars are lovely. The base is light and crumbly. The upper lemon layer separates on baking into a tangy lemon curd and a sweet meringue top. I found the original recipe for these lemon bars at allrecipes. However I upped the amount of lemon juice and flour in the lemon layer and added lemon zest. This gingerbread cake recipe comes from allrecipes. I was a bit worried about using the boiling water, but clearly it’s a magic ingredient because the gingerbread cake turned out beautifully. The abundance of golden syrup makes this a sticky cake to make, but gives it its lovely golden colour and perfectly moist, chewy texture. The perfect accompaniment to a cup of tea or coffee, this gingerbread cake is ideal for elevenses or afternoon tea. Recipe | Rice Krispies stars: puffed rice cereal with marshmallow, white chocolate and sprinkles! So easy to make, kids of all ages will enjoy these Rice Krispies stars: puffed rice cereal with melted marshmallow, white chocolate and your choice of sprinkles! This basic Rice Krispies tray bake recipe gives you lots of options. If you’re short on time, just cut the large rectangular slab into squares. Or use a biscuit cutter to cut out stars or any other shape you like. If you have skewers, lolly or cake pop sticks, you can insert these into your pieces to make treats for children’s parties. I got the original recipe here at GoodtoKnow. This week’s recipe comes from GoodtoKnow. I’ve haven’t tried a mixture of flapjack and cake before, but this recipe produces a chocolatey treat with an incredibly moreish texture. I made one significant change to the original recipe: I put all the chocolate on top rather than inside the oat squares. Jammy Shortcake Biscuit Bites – another no-bake tray bake which is super sweet and simple to make. I think I’m on a no-bake roll. Last week it was Mars Bar and Rice Krispies cake bites, this week I’ve been making tray bake using one of my favourite biscuits: Jammy Dodgers. My mum passed on the original recipe to me from one of Nadiya Hussain’s baking columns in The Times Magazine. I made a couple of changes to the recipe quantities and method, fortunately without any negative repercussions! If you’re not familiar with Jammy Dodgers, each biscuit is made up of two circles of shortbread, wedged together with a sticky layer of strawberry jam. The original biscuit is made here in the UK by Burtons, but a lot of supermarkets make their own cheaper versions. I used Aldi’s own version of the classic biscuit, which you can see in the picture below. Mars Bar and Rice Krispies cake bites: just 5 basic ingredients make this easy, sweet treat! After last week’s brownies, this week I was looking for another tray bake, although what I’ve found doesn’t actually require any baking. These Mars Bar and Rice Krispies cake bites are quick and simple to make. As there’s no oven involved and you can do all the melting using a microwave, they’re also a good option if you want to “bake” with the help of little people. I got the original recipe here at GoodtoKnow. I made a couple of small changes, mostly to the decorative final layer. If you can only get your hands on the original brands, that’s fine. But most supermarkets do their own, far cheaper versions of both these ingredients. I used Tesco’s own version of Mars Bars (any bar containing nougat and caramel coated in milk chocolate will be fine) and Rice Krispies because they were half the price of the original brands (see pics below). Easy to make. Easier to eat! Rocky road is an easy and versatile recipe. In addition to chocolate, marshmallow and biscuit you can add almost any ingredients you want – I chose Maltesers! Rocky road is a great recipe. At heart it is a “no bake tray bake” (if that makes any sense!) which allows you to make your own chocolate bars with very little effort or mess. But before I can continue, I have to ask: who knew Maltesers wasn’t spelt Malteasers? I have been spelling it (if only mentally) as “Malteasers” with the extra ‘a’ my whole life! But no, my friends, it’s Maltesers. 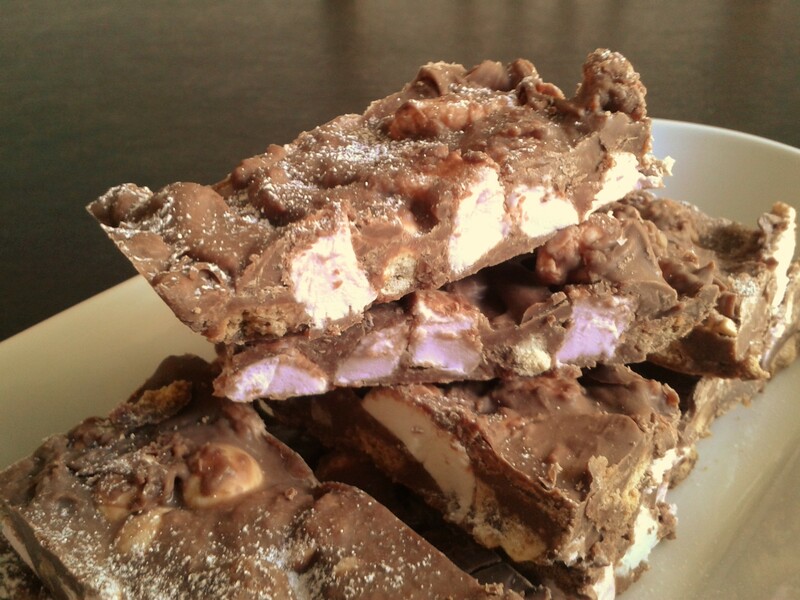 Now I’ve said my piece about that, let’s get on with the rocky road recipe!